Oh I love to womble, to collect things others bin or dump that could be useful. For example when there is a jacket left in the park and it’s soaking and muddy I will take it home to wash it then it goes in our charity bag. If I don’t the council “street cleansing team” will bag it and bin it. I hate pointless waste I really do. When charity bin bags get thrown into a road and get all muddy and run over, I lug that lot home and pop it to a charity of my choosing. My son D calls it stealing, but abandoned things are destined just for landfill. Well this afternoon I was pleasantly surprised to see an abandoned dog crate on a pavement nearby with other scrap metal. The wombled crate is the black one. 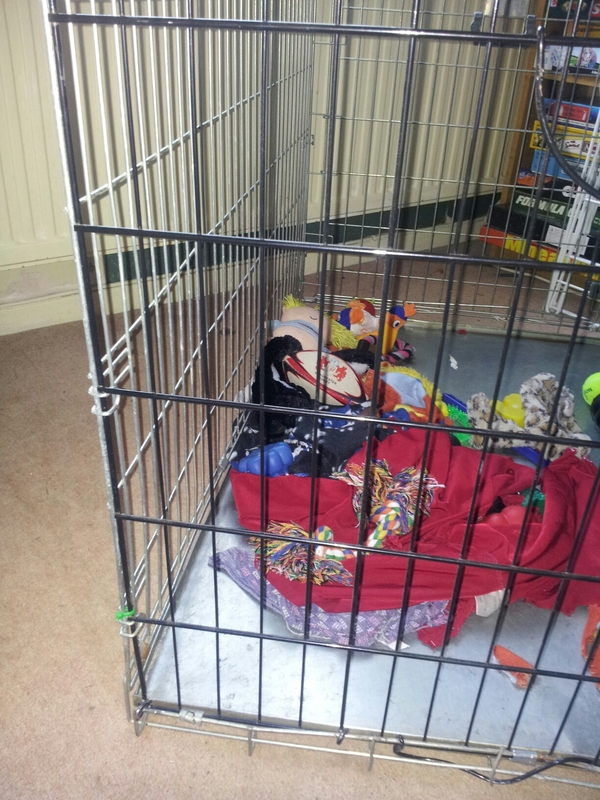 Someone had tried to modify the cage to make it fit in an angled space, under the stairs or for a car boot probably but it had gone a bit wrong. The bit I wanted was in great condition though. Freya got a lovely Rosewood Options crate when she was a new member of the household. In the first few months she caused a lot of damage to the doorless end panel. As a person that hates to scrap things that function I had actually asked Rosewood pet shop if it was possible to buy just an end panel but it was not. Hence I’ve been keeping my eyes peeled for a broken on and this afternoon I got it. You can see in the first photo the damage Freya had caused to the original during her panic attacks. 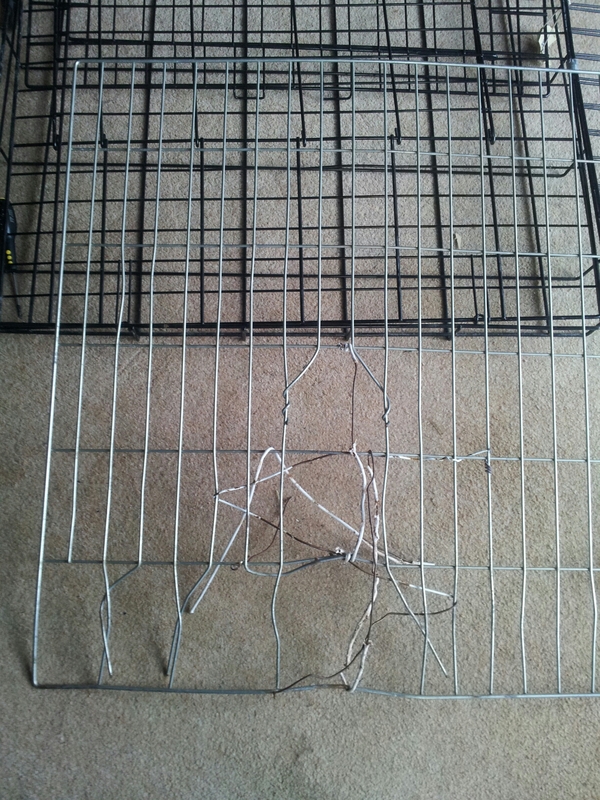 I had used plastic coated wire coat hangers to fill that damage as a temporary measure. Out came various pliers and some flat head screwdrivers to use as tiny crowbars to remove the clasps that hold the sections together. It took around an hour and a half but woofer has a solid crate again it cost me nothing and zero to landfill. Woo hoo. The end panels were 26 by 26 inches on both crates but the black wombled one was not quite as long. So I have put the crate base in my garage as a spare, it’s only 2 inches too small so will work. All the scrap bits of metal are in the shed and will go in to the metal recycling bin at the dump next time we go there. Even though I would have put Freya’s crate in the metal recycling at the dump if I had bought a new crate this is so much more eco. Why not turn 2 damaged items into 1 sturdy and functioning item? Ok it doesn’t look normal with 5 steel sections and a single black piece but I am jolly pleased with this. 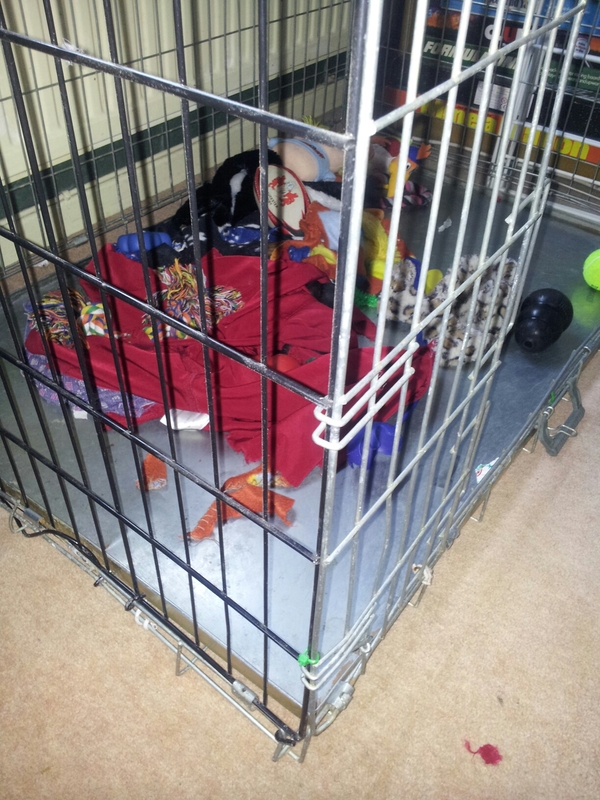 I realise Freya’s toys and bedding look a mess in these photos but she had been digging in her blankets looking for her Kong ball. Do you ever make something good from broken items? Or are you a womble too? Well done you. I am also loving the wombling thing – but I’m not doing as well as you I feel I must do better!! 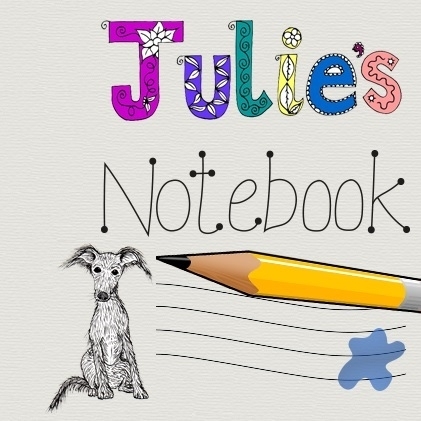 Lauranne recently wrote… They voted no.